We are Supplier & Exporter of Titanium Pipe Flanges, Titanium Gr2 Slip on Flanges, Titanium Gr.5 DIN Blind Flanges, Alloy Gr.2 UNS R50400 Plates Flanges Manufacturer in India. Considered amongst one of the quality oriented organizations, Neon Alloys have come up with a distinctive and wide compilation of Titanium Flanges to our esteemed clients. To suit the diversified requirements of the clients, we offer these grades in various specifications and designs. 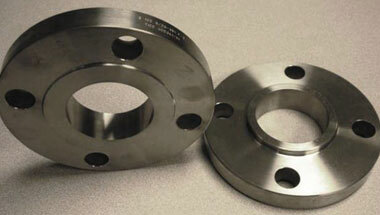 This grade flanges are 40% lighter than steel due to low density but it is stronger than steel. We also offer the complete range of grades like Titanium GR I, GR -2, GR-3, GR-4, GR-5, GR-7 Flanges. We provide different grade Titanium flanges like Titanium Gr 2 Flanges & Titanium Grade 5 flanges. Our product range includes Titanium Blind Flange, Titanium Spectacle Blind Flange, Titanium Slip On Flange, Titanium Socket Welding Flange, Titanium Welding Neck Flange, SORF Flanges, Titanium Collar Flange, Titanium Plate Flange, Titanium Raised Face Flange, Titanium Flat Face Flange, SWRF, WNRF, BLRF, Titanium Lapped Joint Flange, Titanium Ring Type Joint Flange, Titanium Threaded Flange & Titanium Long Welding Neck Flange. ASTM A249 Titanium Flanges, Titanium Gr2 Orifice Flanges, Titanium WNR 3.7035 Forged Flanges, Alloy Gr.2 Socket weld Flanges, Titanium ANSI/ASME B16.5 Reducing Flanges Supplier in India. Ghana, Indonesia, Australia, Houston, Kuwait, Mozambique, Venezuela, United States, Malaysia, Trinidad and Tobago, South Africa, Colombia, Angola, Italy, Brazil, Algeria, Turkey, Iraq, London, Germany, Thailand (Bangkok), Mexico, Chine, Africa, Uganda, Russia, Democratic Republic of the Congo, Saudi Arabia, Morocco, Azerbaijan, UAE, Bahrain, Israel, Vietnam, Cameroon, Sudan, Dubai, New Zealand, Argentina, Jordan, Kazakhstan, Iran, UK, Tunisia, Ethiopa, Nigeria, Canada, Sri Lanka, Peru, Egypt. Maputo, Riyadh, Tripoli, Luanda, Ouagadougou, New York, Dakar, Tehran, Hong Kong, Tel Aviv, Sharm el-Sheikh, Abidjan, Lubumbashi, Lusaka, Pretoria, Nairobi, Bethlehem, Algiers, Giza, Khartoum, Kinshasa, Jeddah, Istanbul, Maiduguri, Port Harcourt, Douala, Port Elizabeth, Cairo, Abu Dhabi, Durban, Bamako, Bulawayo, Kampala, Subra al-Haymah, Brazzaville, Fez, Dar es Salaam, Amman, Johannesburg, Aqaba, Byblos, Yaoundé, Doha, Beirut, Soweto, Conakry, Cape Town, Casablanca, Rabat, Lagos, Alexandria, Manama, Mbuji-Mayi, Kaduna, Mogadishu, Benin, Singapore, Omdurman, Freetown, Accra, Dammam, Data from the UN, Zaria, Kano, Harare, Cairo, Mecca, Ibadan, Colombo, Dubai, Jerusalem, Antananarivo, Addis Ababa, Muscat, Kolwezi.